Go to HaLevanon and search for שנת היובל. 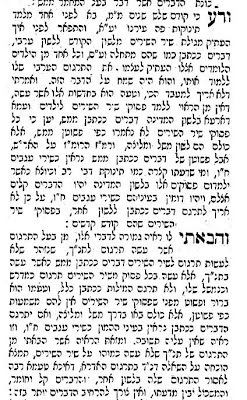 It's an article (written in very heavy Melitzah) describing describing his difficulties as Chief Rabbi of Bucharest (he was thrown into jail and only released thanks to the efforts of Moses Monetefiore). See Heichel HaBesht for an article on his relationship with the Chassidim. The standard work on Malbim is Noah H Rosenbloom, "Malbim: Exegesis, Philosophy, Science and Mysticism in the Writings of Rabbi Meir Lebush Malbim ( In Hebrew)". See Sefer Hamalbim - A. Surasky (on Otzar Hachcoma) for hagiography and some minor works of Malbim (commentary on Rambam Deot Re:Health and Poem). More recently, see Yaakov Heller, "New Documents on the Malbim Affair and his Struggle with the Maskilim," The History of the Jews in Romania: The Nineteenth Century (Tel Aviv, 2005), 2:231-258 (M. Butler told me of this source - I don't have it). How then could they [Artscroll -W.] say that because Chazal and the meforshim take Shir Ha-shirim to be an allegory that "the literal meaning of the words is so far from their meaning that it is false"? Uhm, en mikra yotzi me-dei peshuto anyone? The rest of the Teshuva - it concerns a translation of the Idros into Arabic - is also very much worth seeing. 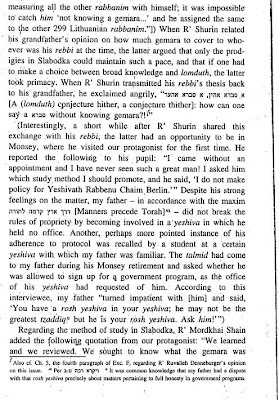 I just saw the part of Prof. Y. S. Spiegel's article in the new Yerushaseinu relating to Otzar Yisroel. He decries the tendency to judge books by their author as opposed to what is written in them. I must say that there is one piece in Otzar Yisroel that almost justifies those who condemn it. I refer to the disgraceful entry on Ramchal where it is written - "לולא תעה בנסתרות כי אז היה למשורר גדול" (and cf. the hesped for Shadal in the next entry - but written by a different author). Otzar Yisroel was a collaborative effort (like JE - R' Eisenstein contributed there but decided to make his own because he felt that it was insufficient.) R' Chaim Hirschenson wrote many of the Halacha related articles and those are of course excellent. But it is clear that some more editorial oversight was in order. Unfortunately, Menachem Butler's AJhistory blog in no longer online as he had a lot of information on R' Eisenstein. R' Eliezer was, of course, the one who forbade teaching torah to women -כאילו מלמדה תיפלות. See Meir Hershkowitz - Al Chinuch HaBanos in Ohr HaMizrach (two parts - maybe online?) for an interesting discussion of all the relevant passages. R' Kook's quasi-biography of his great father-in-law is available online here. There is a famous story (see Moadei HaReiyah) according to which an American priest was so very taken by the descripton of the Aderet in Adar Yakar that he converted to Judaism and moved to Israel with the special intent of translating the sefer so it be more widely know. I wonder where the Oz V' Hadar gemaros stand on all this. The editors freely admit that they in no way intended to produce a critical edition. Thus in their hagahot we have "Kesav Yad", "Defus Rishon", Rashash (,etc.) and then a whole host of some modern-day scholars (Devash Tamar, Be'er Mayim?) whose work I am not familiar with. The hagahot are incomplete as many inportant hagahos that are necessary to understand the text (even from a common source like Dikdukei Soferim) are missing. at a very early time, in Eretz Israel, the source copy, or one of the few source copies of the Yerushalmi, was damaged (nifgam) ... because of the wearing out (be-liyah) or decay (riqavon) of the parchment, or because of fading (dehiyah) or defacing (tishtush) of the ink, in [particular] places. And when the earliest scribes came to copy their Talmuds from this text, they left a blank space to indicate the place of the missing sentences. However, these blank spaces became shorter and shorter in later copies, until they disappeared altogether. And it is possible that they were already intentionally ignored at the end of the this earliest period. As the research of Shamma Friedman over the last decade has shown, the text of the Bavli has, in many cases, been transmitted in two versions: one fuller and the other more sparse, or, most probably, closer to the original. In some cases, these two versions represent ancient traditions. Both Friedman, in his monumental study of chapter 9 of Bavli Bava Met-zia, and Adiel Schremer, in his study of the first chapter of Mo'ed Qatan, have found cases in which each branch has a different attribution for a memra and scribal error does not seem to be a factor. 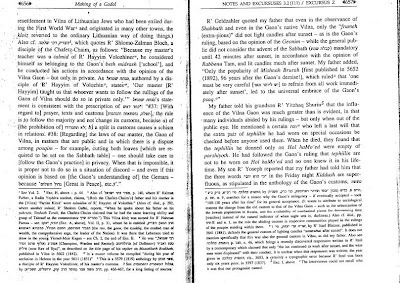 That both of these versions may be relatively early has been demonstrated by Moshe Benovitz in a study of the two versions of Shevu'ot chapter 3, where the fuller - the so-called "ita" version was before Rabbenu Hananel.32a This is particularly significant since the most detailed study of these two versions, that of Friedman in the intro-duction to his Talmud Arukh, employs two sources for each version: the Munich and Florence manuscripts for the ita version, and MS Hamburg and Genizah fragments for the less developed leta version. MS Florence 8 of B.M. and MS Hamburg 165 of the Bavas date to the twelfth century, the latter to 1184 and Munich 95 to 1342. All therefore date later than at least some of the Genizah fragments. And yet, while the Genizah fragments validate the authenticity of Hamburg's readings, let us not forget that one of our earliest full manu-scripts, in this case Hamburg 165, does represent the leta tradition fairly well. Let us not forget that here too we encounter the same situation as with the Yerushalmi and the Mekhilta. At some point in the transmission of the Bavli, when few manuscripts circulated, a change in one was likely, in the course of time, to influence many more copies and copyists. At every branch in the early stemma of the Bavli, as with the Yerushalmi and the Mekhilta, one scribe, whose manuscript served as an archetype for his successors, could determine the text of the Bavli for a millennium and more. In our case, T-S F2 (2) 36  77 gives evidence of a time when our current version was only a marginal comment to that scribe, and the reading of his archetype was destined to disappear completely. But given the rule of small scale, it is probable that his text was the original; we must consider that the marginal comment was the work of one tradent, and began with one copy. But even if this was not the case, how many copies of this more difficult text circulated at a time when written texts were relatively rare? which is I think very much on target. Cf. the satement of the Seridei Eish that R' Chaim's method so swiftly conquered the Yeshivos because it required no great bekius - for anyone can devise a Sevara. (See back of Marc Shapiro's Studies in Maimonides). Concerning the famous Chakira concerning מתוך שאינו יכול לישבע משלם is it that the main obligation is payment but an oath would have also made him פטור or is the main obligation a שבועה but since he can't swear he must pay. R' Weinberg referred to this as a "narishe Telshe Chaikra" for one can similarly ask - Is every person meant to die - but if he eats he will live, or is every person meant to live but of he doesn't eat he will die? R' Yaakov was very much disturbed by the slow pace of the Yeshivos. He rationalized (according to the biography - R' Yaakov) it because - since the students attend college where they are introduced to all sorts of adavanced ideas - they need to be shown that Talmudic study is as advanced and complex as any other discipline. The writer of these lines has failed to find any great personality who supports the current method of studying only a few pages a Z'man. The sole exception is perhaps a statement attributed to the Chasama Sofer (Chut HaMeshulash) to wit: "There is one type of student who learn much but his learning is of no value, and there is another type who apparently learns very little but his learning is of real value. The first type learns hundereds of pages of all sorts of books but he is no more then the proverbial "חמור נושא ספרים" for he has no real understanding of what he studies The second may learn only one page but that page is the sugya in Chullin of חתיכה נעשה נבילה on which half of Yoreh deah is based." I don't believe that the CS statement applies to contemporary yeshivos. If I may add an autobiographical note, I remember the intense frustartion I had in Mesivta. I had finished the daf and the major commentaries and yet was not allowed to continue for the sake of some mythical "havanah". My frustration was such that I was forced לרעות בשדה אחרים in order to find real intellectual challenge. 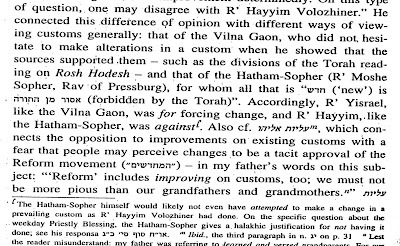 See also the very interesting analysis of R' Dovid Halivni in his P'shat and D'rash in which he demonstrates that as time passed scholars became increaingly wary of engaging directly with the text. While the Rishonim analysed the texts in a very critical manner (as anyone can see by the quotations in the works of Prof.'s Halivni and Friedman), later generation worked "behind the text". This is the reason for the almost exclusive focus in modern Yeshivos on "conceptual analysis". 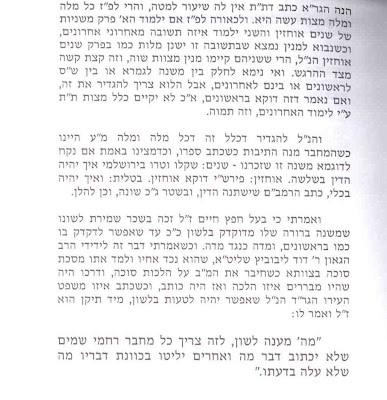 The first chiddush was also published (with some small changes - in Melamed L' Hoel Part 3 No. 125). The second chiddush was never published anywhere else as far as I know. I would point out that the substitution of Gemara for Talmud was a result of an attempt to confuse the Censor's during the Middle Ages when the "Talmud" was outlawed (similarly in 16th century Italy only the Rif was available for a similar reason). The thrid chiddush is discussed at greater length in his piece n the Beis Vaad L'Chchomim that I hope to place online soon. On Lilenblum - see here and here. This edition is the most readable but it only has Part 1. 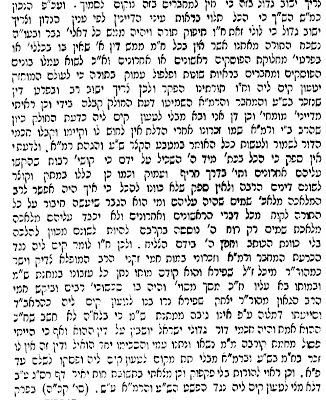 One can also find M. Kunitz's Bar Yochai attempting to refute R' Yaakove Emden's arguments. The book was almost universally disdained (R' Yosef Shaul Nathanson calls him a מפטפט in his hagahot to SA YD. Shir wrote a biting rebuttal that I described here). 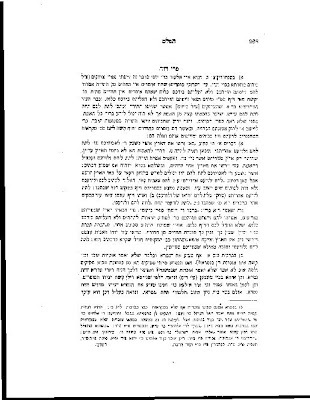 See Y. Y. Greenwald "Mekorot L' Toledot Yisroel" for more on Kunitz (he defends his connection with A. Choriner - my thanks to andy for this source). My earlier post was discussed in Avodah and received the following (rather hard to follow) response. In truth, I had forgotten to cite the very important Pischei Teshuva Choshen Mishpat 25:2 quoting Chavas Yair who discusses which Posekim are considered so important that forgetting them is considered טועה בדבר משנה. It is important to note however that this point (and the whole seif really) is only really relevant to judicial law - not to ritual law which is to a large extent what my post refers to. Is it possible as a result of one's own research to overturn "accepted practice"? I think that this depends on the nature of this practice. I mentioned specifically the Aruch HaShulchan's overtuurning of the Beis Yosef's rule that one must repeat Pesukei D'Zimra after Davening if one comes late. The Aruch HaShulchan proves that the Beis Yosef did not understand the words of the Gaonim on which the pesak was based and since according to Kabbalah one should not repeat PD it is better to do nothing. I always found this example particularly fascinating since it does open the door to a certain amount of halachich revisionism if the text of the posek is proven to be corrupt, etc. 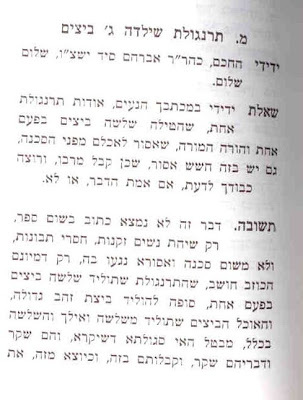 (the Seridei Eish was particularly upset that the Shulchan Aruch had at his disposal so many corrupt texts - obviously he held that the Halacha remains unchanged regardless.) Further, the AS was not justifying any accepted practice but ruling based on his own understanding of the issue. But note that this was a "Shev V'Al Taaseh", and nothing that could be referred to as "accepted practice" . An accepted practice, of "Kum V' Aseh" would of course not be so easily overturned. Incidentally, I recall hearing from R' Bentzion Wosner (I don't recall who he was quoting, it was in a Shiur on the "Indian Wigs" - which he permitted) that if the majority of Rishonim argue against the Shulkhan Arukh then we follow them against the SA. I assume this is because the SA himself based his arguments on the majority between Rif, Rambam and Rosh. I intend to discuss this at some future time but see for the moment Encyclopedia Talmudit sv. Halacha and particularly see Sinai V. 37 pg. 164 referred to there. Kitniyos is an immensely difficult issue. There are two main reasons cited by the Posekim, neither of which are really relevant today but the first (beans stored together with grain) may have been relevant in the time of the Gra(?). I do not desire to go into this here at all. (see also - http://www.bhol.co.il/forum/topic.asp?topic_id=2481264&forum_id=19616). We will discuss some other points (Sephardi Pesak which is not monolithic) some other time. 5. 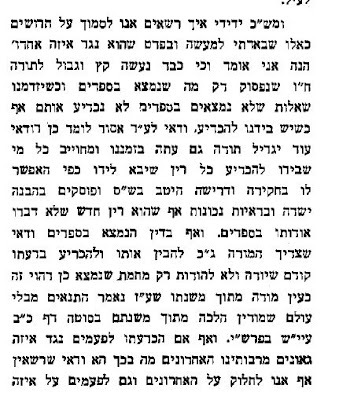 Commentary on Targum Onkelos (here) - also thanks to S.
The Chofetz Chaim’s approach was simplicity. One must first master the simple text with Rashi and Tosafos. I don’t ever remember him getting excited over a shtikel Torah, a good intricate vort. But I do recall him enthusing over solid study." which I think does much to explain the above. The Chafetz Chaim's genius was in the careful way he gave over the peshat of the sugya. He did not focus on developing new chiddushim. 3. There seems to be a mistaken assumption that there was some type of competition between the kulot of the Aruch Hashulchan and the chumrot of the MB which the MB somehow "won". This is incorrect on two counts.The target audience of the MB was chiefly the layman (see introduction to MB), whereas the target of the AS was the Rabbonim (See Mekor Baruch V. 3). In this respect, one can say that both seforim reached their target audience as the AS is still very much studied (and perhaps preferred) among the Rabbinic elite, whereas the MB remians the sefer of choice for the laymen. It is also a mistake to refer to the MB's as a machmir. I refer the interested reader to Benny Browns groundbreaking article on "'Soft stringency' in the Mishnah Brurah: Jurisprudential, social and ideological aspects of a Halakhic formulation. " I have often noticed the MB places a great amount of care in the manner in which he cites earlier posekim. One must distinguish very carefully between a citation in Shaar Tziyon of חיי אדם alone and כן מוכח מחיי אדם or ע' חיי אדם. Further one must assume that if he writes כן מפרש הב"י אליבא דהטור that there are other ways to interpret the טור. appears to be identical almost word for word with the MB so that one wonders why one must "look at the ST" if he adds no new information? I have a possible theory but I am not so happy with it so I would like to see what my readers can come up with before updating the post . 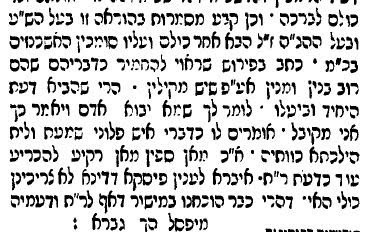 I discussed in an earlier post an interesting rule from R' Yakov concerning the difference between a citation in Shaarei Tziyon and one inside the text. (ע"ש). Someone was kind enough to send me a manuscript of an article that focuses (and expands on that rule). I shall provide the exact reference as soon as it is published. I picked the first example that I found; I am sure there are better ones. There are various commentaries on the Mishna Berurah (the most well known being the new Oz V' Hadar edition) which I am sure contain much useful information. But I think that it would be very useful if someone would explore the method and meaning of the Mishna Berurah's citation of Peoskim in a systematic non-exegetical manner since, as R' Yaakov points out, the great genius of the Mishna Berurah lies in the careful manner of its writing. In a similar manner, the Aruch Ha-Shulkhan hides some fascinating chiddushim in his brackets for example [ ובזה מיושב דברי המג"א]. I once expanded on one of these brackets perhaps I will post it some other time. At the moment I know of only one commentary on the AS entitled by the son of R' N. E Rabinowitz (the Yad Peshuta) called 'צפה הצפית'. Somewhat related, see here for a photo of the Netziv's second wife (and the Arukh Ha-Shulchan's daughter) which contains a link to a very moving letter from Prof. Saul Lieberman. 1. Jeffrey Wolff has an article "The Parameters of precedent in Pesak Halacha"
Cf. the Kaymu V' Kiblu Kol Chachmeio Hador - to the similar term used by R' Moshe. His earlier comments on the same page are also very relevant. Note particularly his comment on the difficulty of deciding what the majority opinion is since many of the Rishonim are still in manuscript. Ta-Shma, I., "The Law is in Accord with the later Authority — Hilkhata Kebatrai: Historical Observations on a Legal Rule", in Authority, Process and Method. Studies in Jewish Law, ed. H. Ben-Menahem and N.S. Hecht (Amsterdam: Harwood Academic Publishers, 1998), 101-128 (translated from Shenaton Ha-Mishpat Ha-Ivri 6-7 (1979-80), 405-423). In my earlier post, I argued thata posek must often choose between the two often conflicting values of precedent and personal autonomy. I will now attempt to prove this argument by citing from the works of three major posekim who discuss the place of these two values within the Halachic process. R' Moshe is argues very strongly in favour of the autonomy of the posek. However he places some important restrictions in favour of precedent. First, although he permits argument with "most Achronim" he only allows disagreement with "some" Rishonim (Which?). He also insists on the canonized status of the "Posekim Me'fursomim Baalei HaShulkhan Arukh" (Who is in this category?). He cites an interesting justification for the second point in this that they were already "niskabel" (accepted) in all of our countries. I am not entirely certain but I think the imprtant source here is the Mishna in Eduyot 1:5 . In relation to this Mishna, we learn (in regards to the permission of oil of a gentile - see Kesubot 2b) that there is an important distinction between a Halacha that was already "nispashet - spread out" among all Israel and one that was never generally accepted . If I understand correctly, R' Moshe is comparing the Shulkhan Arukh to a Halakah that was "nispashet". Note also that R' Moshe restricts the autonomy of a posek to "places where there is great need" and overall stresses the need for caution. He then proceeds to ask if an halakhist must survey every opinion and precedent before arriving at a decision and concludes that one can rely on an individual respected decisor if need be; he reaches this by an ingenious understanding of the well-settled halakhic principle of rov, or majority rule, viz. we can presume that a solid majority of any given decisor’s opinions are more or less correct, and that enables us to follow his views.183 This unconventional reading seems to tell us something about his sense of himself as he stakes out a place for the lone authority. 183 - The principle of majority rule generally refers to the majority of opinions by a group of decisors centered on one specific matter, and is not a presumption as to the reliability of any one decisor deriving from the majority of opinions within his own corpus, dealing with a range of matters; see Encyclopedia Talmudit, vol. 9, s.v. Halakhah, § 7-8. On R' Moshe's unique style of Responsa see - Norma Joseph - Separate spheres: women in the responsa of Rabbi Moses Feinstein.Concordia University. A more recent dissertation comparing R' Moshe's Igrot Moshe to his Dibrot Moshe must also be very valuable but I son't as of yet have a copy (Hat-tip). I was lead to this source by Y. Mirsky's fantastic dissertation on R' Kook. See the lenghty discussion in E. Berkovitz, Ha-Halacha Kocha U' Tafkido Ch. Kochan Shel Chachomim. There are many articles on the canonicity of the Shulkhan Arukh including the Semikha the Beit Yosef recieved from Mahari Bei Rav. See especially I Twersky, The Shulkhan Arukh (I haven't been able to get a copy yet). I've just noticed this site containing a discussion of Confrontation. (Note: Kol Dodi Dofek is available online, as well as some of his articles on traditiononline.org.) including one article by my favourite author Prof. Marc Shapiro. I am somewhat surprised that no mention was made of the locus classicus for the subject - R' Hai Gaon's query of the local Christian priest cited here along with some other sources - based interestingly enough on R' Dovid Tzvi Hoffmann's Der Shulkahan Arukh. See also this article for a Christian view (note especially the conclusion) from the Boston of 1858. 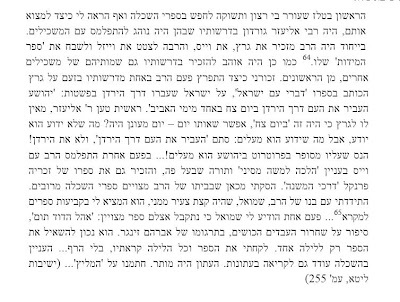 R' Yaakov Emden's comments in his hagahot to Seder Olam are well known. These comments caused him some difficulties from less enlightened members of the community, as he describes in Part 2 of his Sefer Shimush - and see also his hagahot to Shevet Yehuda on the Christian- Jewish dialogues contained therein - published in Tzefunot by T. Leherer. See also the introduction to Kreisi U' Pleisi for the position of R' Yonosoan Eibschutz. 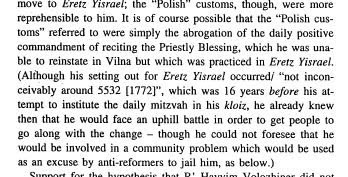 Sinec we are nearing Rosh HaShana it is worth citing Y. Leibes's article on the strange reference to a Yeshua Sar Hapnim in the Yehi Ratzon preceding the Tekios (removed I think in the Artscroll machzor - must check). I have already posted about strange mentions in some of the kabbalistic tefillos in the past. 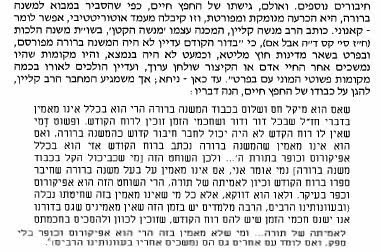 R' Tzvi Hersh Levin's testimony on the authenticity of Besamim Rosh. Rabbi Yosef Shalom Elyashiv is known as the leading halakhist in the Ashkenazi Ultra-Orthodox world. Rami Reiner shows how Rabbi Elyashiv's decisions are hardly ever based on meta-halakhic considerations and suggests that there may be a connection between this curious fact and R. Elyashiv's study of Kabbalah in his earlier years. [Update: His main thesis is untenable. The Aruch Hashulchan who was very much involved in Kabbalah is also known as one of the greatest meikilim. I do not think the Shulchan Arukh of the Baal HaTanya cotains any major Chumros either. Some of the pesakim he refers to as chumrot are not chumrot at all but simply Halacha (e.g. the issur of the Baalas Teshuva who had sexual relations with a non-Jew to marry a Kohen is a clear Halakha in SA IE:6 - the litmus test of Chumra would come into the requierments for checking this out in individual cases. ). R' Elyashiv generally offers more general, as opposed to case-by-case, rulings in which "meta-halachic" considerations are less likely to come into play. In an interesting development, the Hasidic-Mitnagidic controversy which has almost entirely disappeared from the public arena in the last few decades seems to have risen again in the pages of the Haredi scholarly journals. 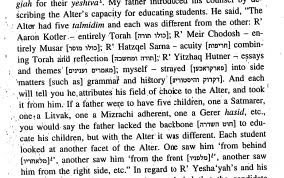 Thus, there is a tendency among Hasidic scholars (most notably Y. Monshine) to identify the Gra and his school (and by extension Misnagdism as a whole) as Maskilim (See the articles cited in Kamenetsky's article on R' Menashe). The neo-misnagdim have not stood by idly and Kamenetsky's article in Yeshrun is to a large part in attempt to clear the Gra and his school of the "taint" of Maskilism. Before I begin, I would like to emphasize that Rabbi Kamenetsky is a fine scholar and he has published many important documents. My only critique is that to a certain extent he allows his political agenda to influence his scholarship. 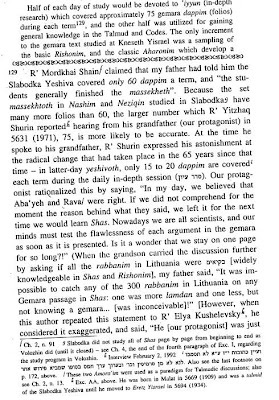 My first critique of Kamenetsky, involves his series of article in Yeshurun - 8-10, in which he attempts to lighten the association of R' Shlomo Dubno (who was connected with the Gra) and R' Moshe Mendelssohn by insisting that Dubno left because he discovered Mendelssohn's "non-kosher" philosophy. The reader is invited to examine the documents cited by A. Altmann in his biography pgs. 399 ff. It is clear from documents relating to the period of the break-up (as opposed to the documents Kamenetsky cites which were written years later) that the chief reason Dubno left was because Mendelssohn refused to publish his lengthy introduction. Kamenetsky's claim that Mendelssohn deliberately refused to publish his introdocution in order to cause Dubno - who was to frum for him - to leave has no basis and in fact contradicts all relevant documents of that period. My second critique involved his important article on R' Menashe M' Ilya (Yeshurun 20). Previously, Prof. I. Barzilay had published a full length biography on R' Menashe (I only have access to the various articles he has published) . As Dan Rabinowitz wrote in his review at Seforim, this book is "rife with sloppy work" and is therefore not very valuable. Despite this, I believe that there is a large amount of valuable material within his book so I would have expected R' Kamenetsky to cite it at the very least. Instead, he simply insists that all Mensahe's biographers up until now were Maskilim with an "agenda". Kamentsky engages in frequent harsh polemics against Menashe's main biographer, Mordechai Plungian. He claims that Plungian deliberately forged the majority of the biography in order to recreate R' Menashe "in his own (maskilic) image". Now, I agree with R' Kamenetsky that Plungian's work is exceedingly unreliable based as it is on hearsay and belonging as it does to the genre of literary historiography (to some degree like Mekor Baruch) in which the author takes extensive artistic license. R' Kamenetsky provides ample proof of its unreliablity. I draw the line at actual fraudulence and I don't believe evidence has been provided to support this . First, there is a reason why Plungian chose R' Menashe as his hero and this could only be because R' Menashe's reputation as an unconventional figure was already well-known. Second, R' Menashe's protestation against those who are afraid of new thoughts and push away all those who come to investigate them  bespeaks some type of personal experience . Regarding, the reconcilation between the three groups that is the focus of Pesher Davar. We are working with the period in which Maskilism first started to become a significant (and controversial) force, in which the Gra's conflict with the Hasidim was at its greatest height and a book is published entitled "Pesher Davar" and tries to reconciliate three groups that roughly correspond to these three groups. 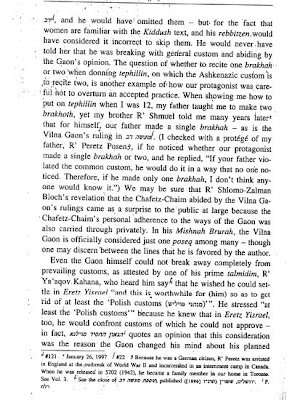 Any attempts to deny that Menashe was attempting a reconciliation between these three groups is like one "who swears on a tree that it is a stone" and Kamenetsky's careful exegesis , if interesting, is analogous to "he who would purify a Sheretz with a hundred and fifty kal v' chomers". R' Menashe was very much the activist (see for instance Marc Shapiros' post at Seforim for an account of R' Menashe's proto-communist ideas - even if this story is apocryphal (I believe it is - this is a famous story with many variants) , it does demonstrate R' Menashe's reputation as an unconventional thinker existed independant of Plungian. Note also his plans to reinstate the Vaad Arbah Aratzos.) and so I imagine that he had very practical intentions in mind with the publication of this pamphlet. 1- R' Menashe's description of the second group describes them as believers of Natural Law. The fact that Kamenetsky has the manuscript and that it shows that Plungian edited significantly is hardly proof. Every author does that. The fact that Plungian does not cite his sources but merely writes Shomati is also not proof. One wouldn't expect Plungian to write the equivilant of "I heard from some guy in a bar" or from "my great-aunt Yentl" and I suspect that is what his "sources" were (hence the books unreliability). See his description of the first group. There are other statements throughout Pesher Davar that seem to hint at some type of confrontation between R' Menashe and the more "narrow-minded" believers. That is why although R' Kamenetsky's arguments against Plungians report that Menashe's books were burnt seem mostly compelling, I still think that there may be some ground to the report. Interestingly, there were also false reports of Mendelssohn's Biur being burnt in Vilna (see Altmann). Something must have been behind all these reports of book-burnings? 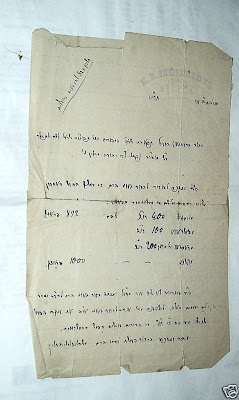 I believe that the discrepancies that R' Kamenesky notes are the result of R' Menashe's attempt to discuss the beliefs that lie behind these movements (note his statement in Alfei Menashe that he never mention the name of the Seforim in order to avoid embarassing the authors) and to avoid referring to specific people themselves. In his discussion of the Gra's famous polemic against the Rambam's philosophy in the Biur. 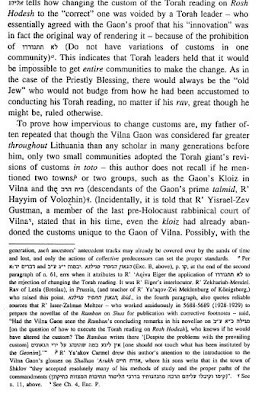 Kamenetsky would have done well to cite J. Dienstag's "The Relation of R. Elijah Gaon to the Philosophy of Maimonides." Talpioth 4 (1949): 253-268 rather then reinventing the wheel. If one has, as I do, theological mentors from across the ages, then it is valuable to realize that their insights on spiritual matters come framed by their particular personal and cultural circumstances... Everything is, of course, time-bound and there is a danger for us who are so shaped by historical consciousness to dismiss every authority from the past once we have understood the peculiarities of the historical, personal, or theoretical factors that shaped its outlook. A far more profitable approach is to employ historical consciousness for developing more discriminating (emphasis in original) assessments of the wisdom of the past. The point of historical scholarship should not be, as it so often is today, simply to take things apart, to destroy myths, or to say that what looks simple is really quite complex. It should also be to help people see how to put things back together again. We need to use history for the guidance it offers, learning from great figures in the past -- both in their brilliance and in their shortcomings. Otherwise we are stuck with only the wisdom of the present. George M. Marsden, Jonathan Edwards: A Life (New Haven: Yale University Press, 2003), p. 502. Rav Moshe Feinstein ruled that Catholics are allowed to use grape juice for the eucharist. To be more precise, R' Dr Aaron Twersky is both a rabbi (from a long line of Chassidic Rebbeim, but I mean "rabbi" in the sense of having a synagogue, not the head of a community) and a psychologist who works in a substance abuse center. One of his patients was a preist who was being cured of alcoholism. This means he can't drink even a drop of wine again; a problem for a priest who must take communion. His self-control just isn't reliable. So what is he supposed to do during Mass? He voiced this concern to Rabbi Twersky, who asked why he didn't just use grape juice. The priest asked his cardinal, and eventually the problem made it all the way to Rome. Can grape juice be used for communion? Well, the Vatican heard that we consider the grape juice a kind of wine, but they wanted to know more. So the question went back to the priest and Rabbi Twersky. 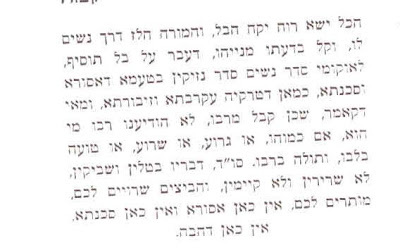 R' Twersky sent back a citation of a responsum of R' Moshe Feinstein, allowing the use of grape juice for the seder. The Vatican concluded that if grape juice is okay for the seder, then it was usable for the Last Supper, and therefore when Jesus said at that meal "this is my blood" he meant grape juice too. In my study of Halachic literature, I have often noticed that there are two different schools of thought among posekim. Among some Posekim, there is an attitude of "יקוב הדין את ההר". The posek analyses the sources and rules based on his own understanding of them. Even if his predecessors ruled differently or understood the sources differently - אין לו לדיין אלא מה שעיניו רואות and הלכה כבתראי as explained by the Rema  (CM 25). This school considers the autonomy of the Posek to be central whereas precedent is only important insofar as it helps the Posek clarify the sources but carries no weight on its own. At the opposite extreme, lies those posekim who feel it necessary to cite and discuss every possible precedent on the issue. These will rarely dismiss the earlier poskim based on their own reading of the sources but instead will insist that one must try to follow all opinions. According to this school, the fact that an eminent authority cites an opinion is itself of Halachic weight (perhaps of even greater Halachic weight then his own reading of the sources) and the autonomy of the Posek is limited. There are of course a variety of positions between the two extremes. I believe it might be instructive before examining any posek to first identify to which school of pesak he belongs to analyse his pesak accordingly. 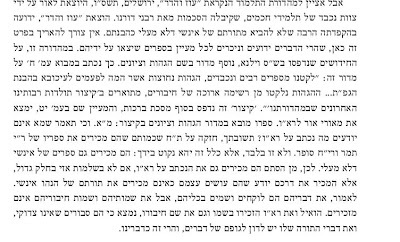 The best example of this school of thought is R' Yaakov Emden who was fiercly independant in his pesakim (See for example this post in which the Yaavetz cites his father that - "Any dayan who is not willing to erase a seif in SA is not worthy of ruling. Mor U' Ketziah is simply full of examples in which the Yaavetz does just that. 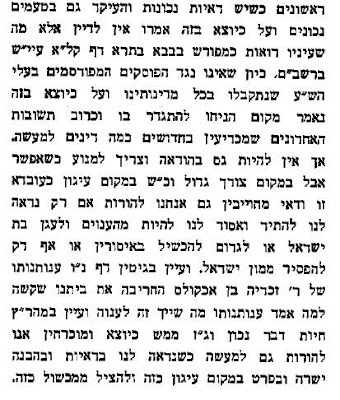 ), then one might point to the Rogatchover who felt himself obligated to the Rambam only (note his correspondence with the SE that Marc Shapiro discusses in his book), and the final and most influential authority in this group is the Aruch Ha-Shulkhan who similarly is not afraid to argue against any of his predecessors if his own reading of the sources leads to a different ruling (See for example his ruling concerning one who skips p'sukei d'zimra if he need complete it after davening). R' Moshe Sternbuch in his Teshuvot V' Hanhagot is also roughly part of this group as he rarely cites Acahronim (but see his Hakdamah) but has his own highly original method of Pesak (see Tradition, R' Moshe Sternbuch's Halachic Novellae). Y. Ta Shema has an article on the principle of Halacha K'Basrai that is somewhat relevant here. The most important posek from this school of thought is the Mishna Berurah who cites every Acharon possible and considers them all obligatory (to some degree at least - cf. B. 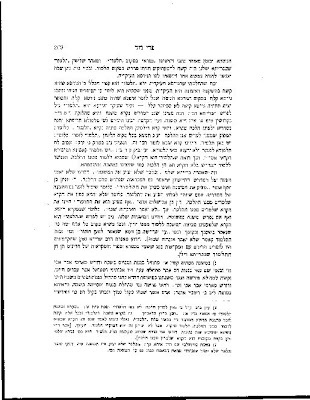 Brown's article in Contemporary Halacha on Soft-Stringency in the Mishna Berurah). A comparison - seif by seif of the Mishna Berurah and the Arukh HaShulkhan's stance to various issues would be most instructive (the new AS's with the MB on the bottom can give you some idea of the differences between them). This is the more famous picture (used on the cover of Tarshish's bio). Thanks to Z, I now know that the Rosh Yeshiva was also reading the Jewish Encyclopedia! Actually, since this must have been a famous criticism against Graetz, and since as Z points out there are sources that it was in fact Spring, which R' Gordon would not have missed, I have reason to suspect the entire story. 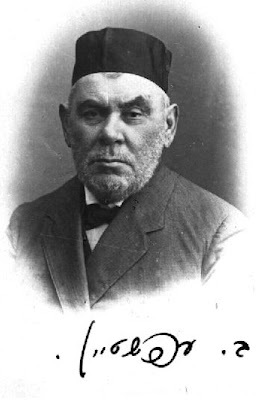 Interestingly, in 1903, Eliezer Gordon (1841-1910), dean of the Telz yeshiva, itself wracked by internal controversies over the study of Mussar, offered Rav Kook the position of instructor in Jewish thought and Mussar. He visited the yeshiva for several days, before turning the position down; several suggestions have been offered as to why; the likeliest, put forth by Zev Rabbiner (and echoed by Zvi Yehudah Kook) is that the rabbinical post in Jaffa was simply more attractive.47 Rav Kook did suggest to Gordon that he institute a curriculum of Bible, Midrash, Zohar, Ha-Levi's Kuzari, Se'adyah's Emunot Ve-De'ot, Maimonides' Eight Chapters and Bahya's Hovot Ha-Levavot.48 Interestingly, the position remained unfilled, perhaps indicating that Rav Kook's mix of theology and Talmud was uncommon among Lithuanian Talmudists of his generation. 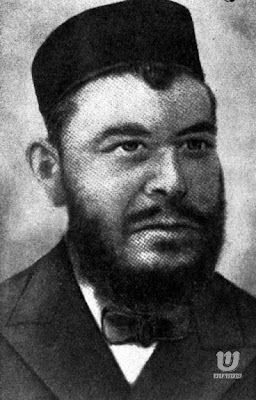 Note 47 - Zev Aryeh Rabbiner, Ha-Gaon Rabbi Eliezer Gordon (Tel Aviv: n.p., 1968), pp. 67, 192. Another version has it that Rav Kook's wanting to teach theology ended his chances, but that is likely a conflation of the aftermath of the two pieces of information recorded by Rabbiner. According to yet another version, the offer was rescinded because Rav Kook's practice of helping his wife in the kitchen on Friday afternoons was considered conduct unbecoming a rabbinical authority. This story, derived from Rabbi Yeshayahu Hadari, was related to me by Rabbi Nathan Kamenetsky, author of Making of a Godol, in a phone conversation, Jerusalem, Sunday, April 27, 2003.